My Supps Power Amino Liquid deliver important amino acids in a liquid form. The body absorbs them particularly well, as they are imbibed. Content is sufficient for use according to our recommendation for 13 day(s). When people speak of amino acids in relation to dietary supplements, the terms non-proteinogenic or proteinogenic amino acids are used. The body draws on proteinogenic amino acids in order to build up body tissue, while the non-proteinogenic amino acids are found more frequently in bodily fluids (e.g. Taurine, Beta Alanine). 20 amino acids are currently known, and they may form elements of thousands of protein compounds in the body. Eight of these compounds are essential to the body. This means that the body cannot produce them itself and is reliant on absorbing them as part of daily nutrition. My Supps Power Amino Liquid delivers the important amino acids in a liquid form. This is intended to ensure that the body is better able to absorb and exploit the constituents. My Supps Power Amino Liquid is a protein hydrolysate. The porcine proteins were broken down in their constituent parts, the amino acids, by enzymatic reaction. Amino acids represent the basic building blocks for proteins and hence supply the body´s protein metabolism. My Supps Power Amino Liquid can therefore serve as a natural support and dietary supplement with protein-enhanced nutrition. Sufficient protein intake of should represent the basis for anyone wishing to build muscle mass. After all, nutritional proteins contribute to the growth of muscle mass. Worth knowing: What other substances are active in My Supps Power Amino Liquid? This product is enriched with additional vitamin B6. Vitamin B6 plays an important role in the human body and is involved in the energy metabolism. This vitamin can also influence functions within the protein metabolism and the exploitation of Cysteine. Cysteine is an amino acid found in human tissue such as hair, skin and the nails. It is also needed for normal cell division and blood formation. 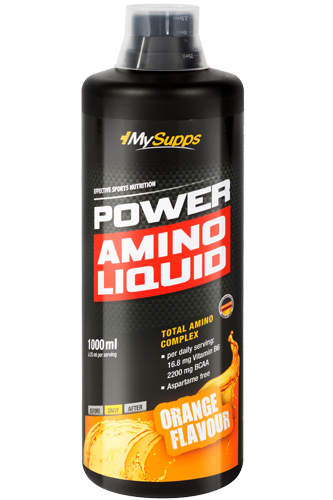 My Supps Power Amino Liquid is available in the flavours orange and cherry. Which products can I combine sensibly with MySupps Power Amino Liquid? With Body Attack Power Protein 90, to increase biological value and help build muscle mass. Together with Body Attack Calcium plus Vitamin D3, because calcium is needed to maintain normal bones and vitamin D is required to preserve normal muscle function.